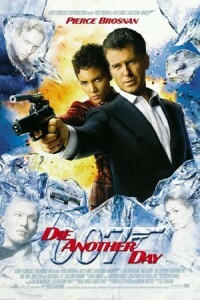 Die Another Day is the twentieth film in the James Bond series, based on the original character created by Ian Fleming and marked the franchise’s 40th anniversary. With Pierce Brosnan (Mamma Mia!, Dante’s Peak) taking the James Bond starring role for the fourth and final time, Halle Berry (Cloud Atlas Cloud Atlas, Monster’s Ball), Rosamund Pike (Gone Girl, Jack Reacher), Judi Dench (Notes on a Scandal, Iris), John Cleese (A Fish Called Wanda, Trolls) and Michael Madsen (Reservoir Dogs, The Hateful Eight). The film sees Bond captured on a mission in North Korea after his true identity was leaked. A year later, he is released in exchange for a terrorist but MI6 relieve him of his “00” because they suspect he gave away secrets during his capture. Trying to prove his innocence, Bond sets off to find his betrayer as well as the terrorist he was exchanged for who has an evil plan – will Bond be able to stop him? With an A-list cast including Pierce Brosnan as James Bond, Halle Berry as sidekick Giacinta ‘Jinx’ Johnson as well as Rosamund Pike, Judi Dench, John Cleese, Michael Madsen and even an appearance from Madonna! The Die Another Day team visited the now closed Manston International Airport (now Stone Hill Park) in Ramsgate to film the Antonov cargo plane scenes towards the end of the film. The Thanet area has been previously used for filming Coast Vs Country (2016), True Love (2012) and Gypo (2006). The film is now out to buy on DVD. This entry was posted in Filmed in Kent and tagged Die Another Day film locations, feature film, Halle Berry, James Bond, John Cleese, Judi Dench, Manston International Airport, Michael Madsen, Pierce Brosnan, Rosamund Pike, Stone Hill Park. Bookmark the permalink.